Another big thank you to the excellent Polish Jazz blog for turning me on to another emerging artist on the global scene. Nestled somewhere between the works of Kronos Quartet and ECM's "New Series" lies this rewarding and inventive piece of modernism by accordionist, Robert Kusiolek. 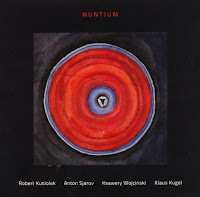 Obvious Astor Piazzolla comparisons would arise when listening to a piece composed by an accordionist but let's truly take Kusitolek's Nuntium debut on its own merits. Kusiolek is a well studied and uniquely gifted musician, composer and improviser. Combining a classical tradition with avant garde aesthetics his quartet build a deeply melodic but emotional responsive album built on seven "chapters". Each chapter finds the group experimenting with different sound structures that are beautifully executed and set a lovely and relaxed mood. "Chapter III" and "Chapter VII" both present an exploratory vision of Kusiolek's thoughts as a composer he's combination of chamber music and minimalism wrapped in long verses and tightly interwoven storytelling. Both Sjarov and Wojcinski shine in a dueling interchanges with Kusiolek on "Chapter V" which moves up and down in pace. Sjarov adds that free jazz movement in his subtle but highly effective basslines. "Chapter V" really is where the group lets loose in dramatic fashion with Kugel and Kusiolek ripping through chords with reckless abandon. "Chapter VI" brings things to bit of a more level tone but still with a sense of freedom and adventure led by some fine improvisation by Kusiolek and Sjarov. Moving through various themes and patterns in just under 50 minutes, Nuntium is relaxing, thought-provoking and beautiful. In the same manner in which Kronos Quartet have been destroying the thoughts of classical music for decades, Robert Kusiolek's arrive shows that there are more musicians thinking how modernism can continue move upward and beyond. 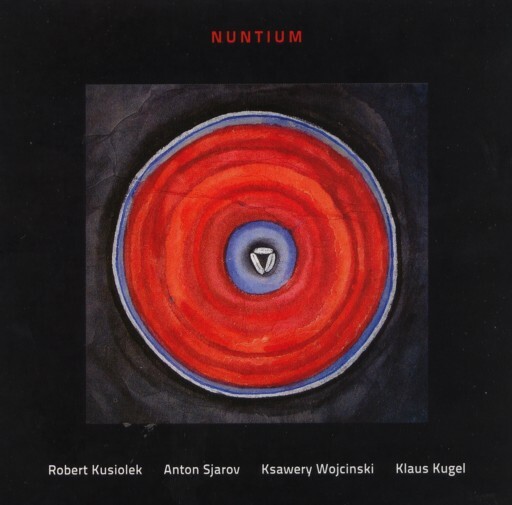 Nuntium may not be every one's cup of tea but if you are a fan of avant garde and improvised chamber music, Robert Kusiolek has created brilliant work that is a serious must listen.